cat mac birthday slam – one year. two scots. three continents. four grand slams. Parkrun #17 – Krakow Bonus Parkrun! So happy I did it! It was definitely the coldest parkrun of the year, with my phone reading -6 degrees celsius when I woke up that morning. However, the skies were blue and the sun was out which made the frosty run a very enjoyable one. One lap and a bit round the perimeter of the park – flat as a pancake! And a very respectable time of 30:45 despite doing no running for the last three weeks. Winning! The coolest thing about this parkrun was that everything was in Polish in terms of announcements and instructions. I had no idea what was going on, except I did, because every parkrun follows the same format, regardless of where you are in the world! Love it. I also enjoyed my free, hot rooibos tea at the end. Parkrun #16 – Bushy Park Finale! I did it! 12 months of running, 22 parkruns in total, with 16 different routes, across four different countries, finishing at the original parkrun location, Bushy Park on December 2. My first parkrun in Melbourne, Australia seems like a very long time ago. ‘Did you ever think you might not do it?’, asked my friend Susie last month, referencing my motivation to meet my 12-month target. Though my immediate reaction to this question was shock that anyone would doubt my commitment to the cause, Susie’s question was completely valid. My commitment to life in London over the past three and a half years has been quite poor. I’m sure I’ve been talking about moving back to Scotland since year two, and I could probably spend a good ten minutes rattling off all of the extra-curricular activities that I’ve started in London and then stopped for one reason or another. However, despite this being the context in which I started running, I never doubted that I would complete my mission. Once you’ve put yourself out there on the blogosphere especially, it’s a bit more difficult to give up! I guess there’s a level of accountability there that I created for myself to ensure that I achieved my aim. In addition, because running is such a positive thing to do in terms of maintaining fitness, as well as contributing to positive wellbeing, I felt like giving up on running would be counter-productive. A core group of friends joined me for the final parkrun of the year in the slightly-out-of-the-way zone 6-located Bushy Park. It’s the first parkrun I’ve ever been to that started early, which caught us all off-guard. Bushy Park is another flat route which winds round the park, bringing you back not far from where you started. With approximately 1000 runners every week, it’s definitely the biggest parkrun I’ve ever been to, and as a result they have a double funnel at the end to file runners through. To be honest, it wasn’t my favourite route in the world – I found it quite dull. But then again, no park looks at its best in December! My final time was 30:15, frustratingly close to be sub-30 goal, but not quite there. It’s like it happened on purpose to ensure I kept on running in 2018. Don’t worry, I fully plan to do so. Parkrun on New Year’s Day, anyone?! Just in case I’d forgotten, parkrun was straight on it this week to remind me of my parkrun achievements. It’s like I’d turned 21 and they were wishing me a Happy Birthday. Or simply ‘Catriona, did you know you are 21?’ Fortunately, parkrun does not lie; last weekend I completed my 21st parkrun of 2017, and my 15th different parkrun in total. Only five more (different) parkruns to go and then I’ll become an official parkrun tourist! For the big 2-1, I ventured to Mile End in east London, to run with my Utrecht flatmate of 2007/2008, Ailidh. Unfortunately, I wasn’t quick enough off the mark to take advantage of Ailidh’s brief running career (she did a 10k in the summer!) which meant she stayed in her lovely, warm flat whilst I ran around the park literally in front of her abode. Oh to live that close to a parkrun! However, it turned out I have more friends in Mile End than I realised and at the last minute I managed to persuade my work friend Hamid to join the partay. I love introducing people to parkrun. Though my day in Mile End was lovely, this parkrun route was not my favourite. I think it’s because the park isn’t really that big compared to other parks where I’ve run, which means the options for routes are quite limited and in this case, straight and uneventful. You essentially run a length of the park, then back on yourself, and repeat the route one more time to make up the 5k. Annoyingly, Hamid also managed to beat me by around 10 seconds, despite this being his first ever parkrun. I’m not sure that’s how it’s supposed to work? That same week, I ventured out to a running club at King’s Cross called Run KX. It’s a free 5k run, led by a really cool guy called Martin Whitelock, and it starts just down the road from my office. In my head, I was going to go to this running club for two weeks in a row, before my parkrun finale at Bushy Park. In reality, I only went once. Why? Though I had a great sense of achievement after my one and only run (so far, at least), I was by far, the slowest person in the pack. There were maybe 15 of us that night, and we did a 6.6k run from Granary Square in King’s Cross, up to Primrose Hill and back again. Martin had to keep coming back to check I was ok. “You know where you are now, right?”, he kept asking me. Never have I felt quite so much the south Londoner. “Nope, still no idea!”. I remember getting to the finish point and everyone else was already halfway through the cool-down. I felt like maybe I’m not running-club material quite yet. The experience highlighted to me all of the reasons why I am such a big fan of parkrun. The volunteers don’t pack up until every runner has completed the route. Others cheer you on because they themselves have been cheered on. You never come last, because you ran, and that means you’re way ahead of all of the people who didn’t run at all. It’s such a positive environment. Bushy Park, bring. it. on! Being from the capital of rural Scotland, there weren’t many opportunities to meet anyone famous while I was growing up. I think I received an autograph from Cobra from Gladiators when I went to see a pantomime at Eden Court, back in the yonder 90’s. I upped my game (slightly) at university, meeting Bradley from S Club 7 at Potterrow one Big Cheese night. I even got my photo taken with him and everything. I know, right? I’m basically a pop star. I hope these anecdotes illustrate why I proved myself to be the ultimate fangirl the time that I did actually meet someone who is known to a global audience; I have minimal experience of playing it cool! So where and how did I meet Judy Murray? Earlier this summer, Judy published Knowing the Score, an autobiography that details the pivotal role that tennis has played, and continues to play, in her family’s lives. Over the summer, she travelled around the country, promoting the book, and after I missed her doing a book-signing at Waterstones, I jumped at the next opportunity to meet her. This turned out to be an event run by the delightful independent bookshop in Dulwich, Village Books, complete with interview, Q&A, and an opportunity to get your copy of the book signed by the lady herself. Judy: ‘Ooohhh, that’s good’. (No idea if Judy actually said this). CatMac: ‘So can you address it to catmacbirthdayslam ?’ (I think I forgot to say I blogged about my grand slam tour so this probably seemed extra random). CatMac: Thank you! (I hope I said thank you, I actually have no recollection of how it ended). Cue us walking away and then me reliving the entire conversation to James over and over again on the bus back home. And then to my flatmates, and then to my sister, and then to my fellow Andy Murray fans Alison and Becky. And then, of course, I had to tell Twitter. Now there are many reasons why I am a fan of Judy Murray, but what happened the next morning probably tops them all. She tweeted me back! So kind of her to imply there was mutual waffling. So Jamie Murray has liked my tweet, Judy Murray has tweeted me back, and Andy Murray? Does not use Twitter. Will need to think of another way to get his attention! This is it. The final, electronic, grand-slam postcard of 2017. All the way from New York City! At least that’s where the photos were taken. As per tradition, I am writing this a few weeks after the event concluded (five, to be precise), which I’m going to argue is because I am in denial. How can the grand-slam tour be over already? Bodyguard: “Ma’am, please put away your (amazingly beautiful Scottish) flag,”. The photo below depicts said bodyguard doing his bodyguard thing, moments after telling me my flag was an inappropriate accessory. Seriously, what do these grand-slam tournaments have against flags? Anyway, between my flag fiasco and me cheering “Well done Jamie!!! !’ a million times in my proudest Scottish accent, I think I achieved my goal of letting Jamie know that his fellow country-people had his back. I’ve also learned that when there’s a competition to get to court-side for signage opportunities, the cute, tiny children are always going to win. No worries, guys, I’ll just chill back here in the second row, grinning madly like the cool, 30-year old mahoosive fan that I am. Tennis aside, I really enjoyed my brief stint in New York and for the first time in three visits, I felt like I was finally getting to grips with the city – a feeling I also had when I was in Paris. FYI the number 7 subway line in New York is the equivalent of the Victoria line in London; it’s the line that takes you everywhere you need to go. At one end, Flushing Meadows. At the other end, Times Square and Grand Central Station. And somewhere in between, our hotel for the first few days, and my Air BnB when I returned for the final day of the slam. Oh yes, I have this NYC thing all sussed out! One particular novelty from this New York adventure was the rare reunion with Kenneth and Anna, aka both siblings, at the same time. Sure, we never meet in the UK but New York, you say? Yes, let’s have brunch! We also wandered along the High Line, once a rail-track, now an elevated linear park, which towers above street level, allowing you to get away from the traffic and explore central New York from a raised perspective. It’s a very cool concept which offers a slice of relaxation in an otherwise hectic Manhattan. Brunch was a common theme on this trip, as it is in most weekends in my life, and New York did not disappoint. Though I’m not sure I’ve ever paid quite so much for a brunch as I did when Anna and I went for brunch at Bluestone Lane beside Central Park (post-run, might I add). Oh America, with your crazy tax and tipping systems. This is where the girl hovered an iPad in front of me, but didn’t let go, so she could fully observe just how much I tipped. No pressure at all. Thankfully, the food was delicious and fortunately for my bank account, I do not live in New York. Another highlight, later the same day, was going up the Rockefeller Center which gives you sweeping views over Manhattan and, crucially, the Empire State Building (as opposed to being inside it). Whilst I may have bought my most expensive brunch of life earlier that day, at least this ultimate tourist experience was free, thanks to my pal Sara hooking me up with free tickets via her friend who works in the same building. A recurring theme of all of my blogs: having friends is the best. Fun fact: I stole photo inspiration for the pic below from a Lonely Planet blog post titled: ‘10 iconic NYC Instagram Spots‘. LP knows what it’s chatting about. Though I’m a fan of Manhattan, I’m really glad we stayed across the water in Long Island City, and explored, albeit very briefly, a different part of New York. Before I headed to Flushing Meadows on that finals Sunday, I took the scenic and novel $2.75 NYC Ferry from the end of my street (Hunters Point South) all the way down to Dumbo, a great starting-point to explore Brooklyn, and view the landmark Brooklyn Bridge. I didn’t really have any great purpose other than wandering about aimlessly but loved having the freedom and time to do just that, especially with the sun on my side. I came away from this final trip thinking, ‘I could do this again’. 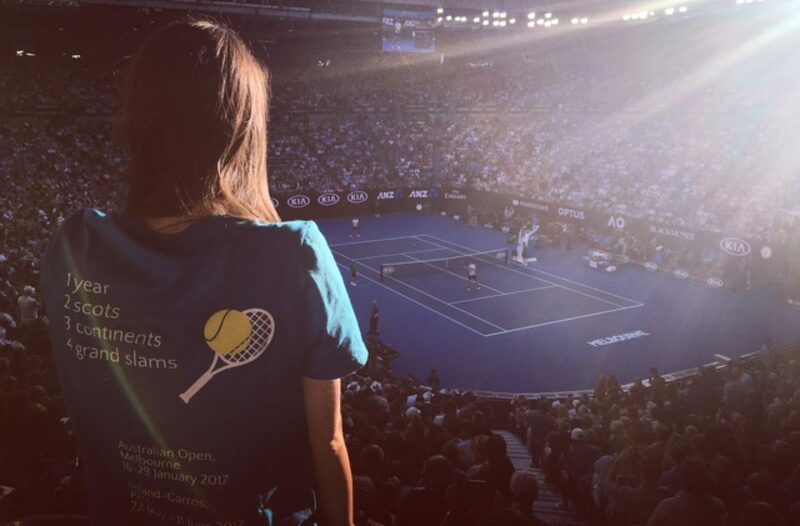 In fact, with the exception of the Australian Open, for obvious reasons, I’m half considering doing the rest of the grand-slam tour again next year. Is that crazy? At least, in my mind now, it seems pointless going to Paris or New York unless I’ve coordinated the dates with the respective grand-slam tournaments. If tennis can feature, why go there at any other time?! However, for 2017, all that’s left for the era of catmacbirthdayslam is to focus my efforts on the rest of my parkrun challenge. Can you believe I’ve been running consistently for 10 months? Maybe next time I go to NYC, parkrun will be there, too! I can dream! Parkrun #13 – Roosevelt Island, Washington D.C.
“So we’re essentially going to D.C. to do a parkrun,” I told my friends, as I explained my planned itinerary for my US Open grand slam adventure. Contrary to what you might expect, the parkrun phenomenon has not yet reached New York City, despite its growth more generally in both the US and Canada. This meant Sister Mac and I had to think more creatively about how to fit in a parkrun stateside. Because obviously we had to fit in a parkrun stateside! Fortunately, when it comes to parkrun, Anna is even more of a keen bean than I am and unlike most of my parkrun ventures, I had to do zero research. D.C. seemed like like the most logical solution: only a 3.5 hour train journey from New York; the capital of the US so, you know, historically a big deal; and perhaps most crucially, a part of the US that I’d never been to before. I was on board. Roosevelt Island parkrun is one of two parkruns in Washington DC. Interestingly, to get there, we had to venture into neighbouring state, Virginia. Note, we did not travel far; DC is just tiny! I’d anticipated that I’d struggle on this run because of the heat but fortunately for me, the majority of the route is in shade. You essentially run along a large section of boardwalk, through a forest, do a small loop, and then return the way you came. I enjoyed the route so much that I actually took out my phone and started filming whilst running – maybe this is why my time was so terrible! 5.2k (classic not-actually 5k distance on Strava) in 33:22. Compared to parkruns in the UK, the attendance was small at this event, with around 80 participants. A lot of people seemed to be ex-pats on holiday like us, and I was particularly amused to meet a girl (orange t-shirt below) who had done the runners’ briefing at the Burgess Park parkrun in London that I’d attended only a few weeks before. Shout-out to fellow Andy-fan Rachel who also joined us for her first ever parkrun, having arrived in DC for a summer placement only the weekend before. It’s meetings like these which make the world seem very, very small.